Early on in pursuing my life coach certification, I learned that helping others to become unstuck and move forward is inherently understood. Judging by the popularity and rise of life coaches in a multitude of niches, the concept of life coaching strikes a resounding chord in many. That is why I am grateful for the addition of Listen To My Life to my coaching toolkit. Through my own and witnessing others' processing, I find each of the eight maps to be content rich and designed to take a mapping participant beneath the surface or up higher for a different perspective. Thus, the maps' versatility makes them adaptable to a variety of coaching needs, whether a particular map I suggest be processed, or a set of questions drawn from the context of a specific map. As David noted in the above scripture, it is God's activity in one's life that accomplishes the arming and the aiming. I've found that the 'three-fold cord' of a ready coaching client, an available life coach, and the ministry of the Holy Spirit accomplishes much. The life maps may rest for a bit but they are never in 'retirement' for very long. They are a tool at the ready when God's quiet prompt comes. 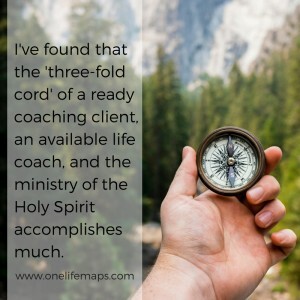 If you are a life coach or are being coached, I encourage you to explore adding the life maps to your coaching experience. They come with my 'armed well and aimed in the right direction' recommendation! Lord, I bless these with a heart to serve and minister in Your Name. May you encourage, embolden, and energize your life coaches whose passion and purpose it is to see others gain wisdom, clarity, and forward movement in You and in their life circumstances.